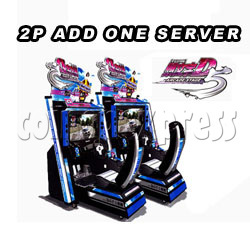 Initial D' Arcade Stage Version 5 (2 players W/server) is the version 5 driving arcade games from Sega Initial serial and features in played as a single machine or linked up to 2 machines with a server. Apart from the usual updates to characters, story lines, tracks and cars. There have been major changes to the gameplay mechanics, namely the steering. Most notable, the removal of wheel locking, while this removes some of the more realistic gameplay, will allow less experienced players not to slam there car into the nearest obstacles when taking corner at higher speeds. However the mechanics of shifting into and out of corners, especially hairpins are more realistic and there is on needing to turn the wheel more to turn round corners, which leads back to the whole removal of wheel locking. Five cars, including the Lancer Evolution VII and the MR-S, have been added to the game, along with a new course set in Nagano and the return of the the Happougahara course from part 3 of the series.